With the increased rate of technology adoption, the U.S., healthcare sector is undergoing a transition through the three wings of data management: data collection, data sharing, and data analytics. The healthcare organizations are appreciating effective usage of analytics tools that ensure statistical and qualitative analysis of clinically rich information. The real promise of analytics lies in the ability to transform healthcare into a truly data-driven culture. While organizations are using analytics to achieve a broader range of objectives in terms of innovation, and faster workflows, the innovative approaches to healthcare delivery is increasing complexities and competition. To tackle this, the next target for analytics is to be more prescriptive—means it doesn’t stop at showing a likely outcome, but continues to demonstrate suggested actions to make healthcare providers more successful, profitable or responsive to patient needs. In the last few months, a distinguished panel comprising of CEOs, CIOs, VCs, analysts including Healthcare Tech Outlook editorial board reviewed the top companies in the healthcare analytics space, and shortlisted the ones that are at the forefront of tackling industry challenges. The selection panel looked at the vendor’s capability to fulfill needs of buyers with effective solutions that curb the challenges associated with healthcare analytics. In this edition of Healthcare Tech Outlook magazine, we bring to you “Top 20 Healthcare Analytics Solution Providers 2015” featuring the companies creating an impact in the analytics sector. Apervita empowers health enterprises to democratize health analytics, transforming their wealth of health knowledge and data into 100s of computable analytics. A provider of SaaS based solutions that helps extract real-time operational intelligence from patient feedback and to offer actionable insights to healthcare companies and physicians. A big data consulting and technology implementation firm that delivers strategic and comprehensive data solutions for the healthcare and other sectors. A leading healthcare technology services and solutions provider. A firm that offers the only Managed Analytics Platform that brings together self-service data preparation with visual data discovery. A big data analytics company that empowers payers, providers and pharmaceutical companies to make intelligent data-driven decisions. Enables health care organizations to fundamentally improve care by building the most comprehensive and fully integrated suite of healthcare data warehousing and process improvement solutions available. 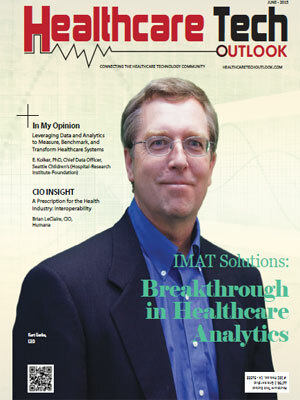 IMAT Solutions provides fast and reliable medical data for search and analytics solutions. A leading technology company that combines advanced cloud-based data analytics and data-driven intervention platforms. An industry information consultancy that enables organizations to transform their information into business results through data and analytics innovation. Provides evidence-based insights to solve problem that plagues health care how to use the immense amount of patient data collected along the care continuum to deliver cost – effective care and promote a healthier population. Providing SaaS platform and services that leverage rich data, prescriptive analytics and behavorial economics to recommend, manage and optimize consumer engagement. Optum is a leading health services and innovation company dedicated to helping make the health system work better for everyone. Providing leading-edge, patient-centric clinical decision support technology and reporting analytics to help improve care quality. Provides services to Healthcare Providers and Insurers that focus on Healthcare Information Technology Solutions. Leverages the power of healthcare data, predictive analytics, and healthcare business experts to provide clients the solutions to decrease costs, improve health outcomes, increase revenues, and drive ROI and sustainability. Provides community-wide interoperability, real-time health care analytics and intuitive care tools. Delivers unbiased information, analytic tools, benchmarks, services, and related expertise to the healthcare industry. Transforming the business of healthcare by providing data services, analytics, and advanced technologies that answer the industry’s most complex challenges. Deliver comprehensive insight and capabilities to manage clinical and business performance.